On March 17, 2014, the Sacramento-based Pacific Legal Foundation filed a brief in support of the First Free Will Baptist Church in Bakersfield against Governor Jerry Brown’s extraordinary petition to allow the State of California to borrow money to fund California High-Speed Rail construction by selling Proposition 1A bonds. Citizens for California High-Speed Rail Accountability (CCHSRA) is fighting this petition, which would undo our court victories in 2013. A Sacramento County Superior Court judge ruled in 2013 that the California High-Speed Rail Authority failed to comply with Proposition 1A as authorized by voters, and therefore the state could not sell Prop 1A bonds. Governor Brown, the California High-Speed Rail Authority, and other officials asked the California Supreme Court to override the lower court decision and allow the state to issue the bonds. The California Supreme Court appropriately bounced the petition back to the California Court of Appeals for the 3rd District. The brief is also posted at the Pacific Legal Foundation web site, along with a podcast explaining the brief. 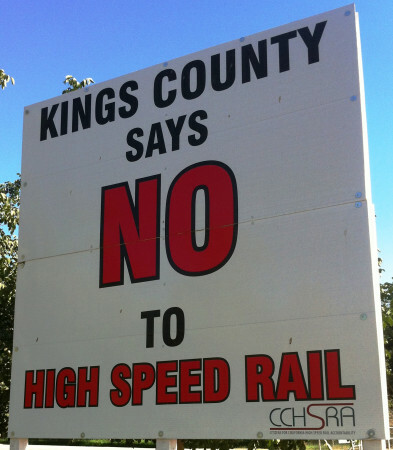 Citizens for California High-Speed Rail Accountability (CCHSRA) co-chair Frank Oliveira will be interviewed live at 12:30 pm today (February 12, 2014) on the Ray Appleton show on Fresno radio station KMJ 580 AM. Frank will be speaking from the World Ag Expo in Tulare, California. This is the world’s largest agricultural exposition. Governor Jerry Brown will be there this morning. For the latest controversy involving California High-Speed Rail, read Public Gets First Crack at New High-Speed Rail Business Plan – article by Tim Sheehan in Fresno Bee – February 11, 2014. California Attorney General Kamala Harris filed a brief this afternoon (Monday, February 10, 2014) on behalf of Governor Jerry Brown, California State Treasurer Bill Lockyer, the Director of the Department of Finance, the Secretary of the State Transportation Agency, the High-Speed Rail Authority, and the High-Speed Passenger Train Finance Committee. Their goal is to get the California Supreme Court to allow them to borrow money for California High-Speed Rail by selling bonds, thereby overruling two November 2013 decisions of a Sacramento County Superior Court judge determining that the California High-Speed Rail Authority failed to comply with state law (Proposition 1A) that establishes conditions to issue the bonds. Here’s the brief: Petitioners’ Reply to Preliminary Opposition of Real Parties in Interest – Stay Requested by March 1, 2014. The brief states that the case involves “weighty matters with far-reaching implications that demand this Court’s rigorous consideration…the stakes are high and the risks are great…” That’s probably the only statement in the brief that has unanimous agreement among the parties. Expressing the highest levels of professionalism and respect for fellow California citizens, the brief also dares to call the winners of the two Sacramento County Superior Court cases “a collection of special interests.” That’s how they treat citizens who seek California High-Speed Rail accountability.